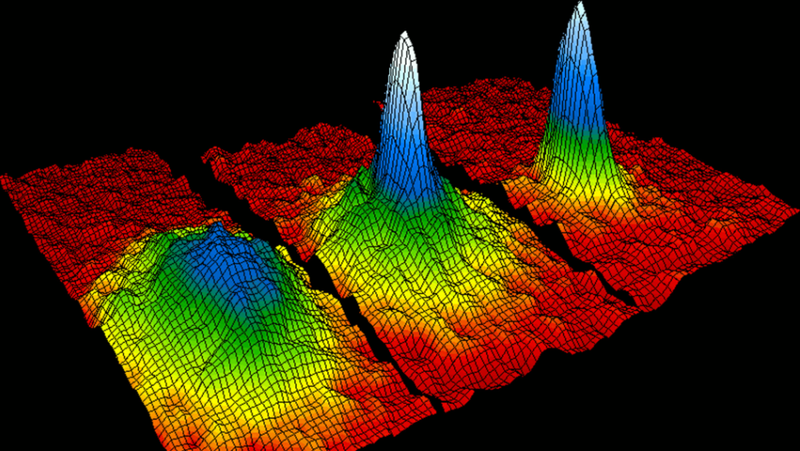 You may have heard of the Bose-Einstein Condensate because it is one of the states of matter. Like gas, liquid, or solid, it has its own properties. Predicted by a maverick physicist back in the early twentieth century, it was only proven to exist in 1995. And it's pretty damn weird. You undoubtedly know one of the people who contributed the theory of Bose-Einstein Condensate, but what about the guy who wasn't named Albert? Satyendra Nath Bose was a physicist who had a nutty theory. He believed that light could be parceled out in tiny packets called "quanta." I know. What a loon. He also came up with a number of rules for distinguishing different quanta based on their different energy levels. When he was not taken seriously, he sent his calculations to Einstein, who decided to apply Bose's ideas about light to atoms in a gas. At regular temperature levels, nothing remarkable happened. When the temperature dropped perilously close to absolute zero, Einstein believed that the atoms would take on a strange property. Not strange properties, but one strange property. The atoms would drop into the same energy state. There would be no way to distinguish between them - not even spatially. It took until 1995 for a group of scientists, lead by Eric Cornell and Carl Wieman to actually form a Bose-Einstein Condensate. It's tough to make, and even tougher to recognize. The atoms in the single energy state aren't just mathematically identical. They "condense" into what is effectively one atom - a superatom. At the moment there are no uses for Bose-Einstein Condensate. Some people think that it might be used someday to make adjustable structures or for some kind of lithographic printing. For now, we just have to be content thinking that it's out there. Via Colorado Edu,The Everything Einstein Book.